I won't even dare call this a Review. More of an Unview. Myself, biwi and saali decided to head for some lunch and a movie this sunday afternoon. And the choices we had for the movies were pretty limited. 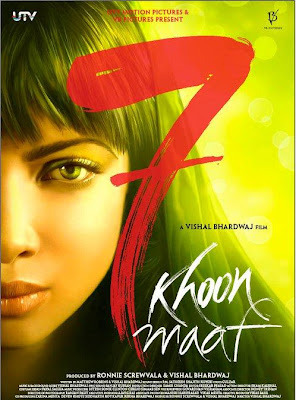 After reading Nikhat Kazmi's and Taran Adarsh's 3 star reviews on some websites, decided to take on 7 Khoon Maaf, even though Rajeev Masanad seemed to advise against the move. The entire January and February months were spent going to umpteen weddings and we had no inclination to be present at Tanu & Manu's do. Tickets were freely available online (I hoped that the India Vs England match had to be responsible for that! ), and so after a slightly mundane buffet lunch at Yakshaa (Above Brand Factory, Banjara Hills) we set out to Cinemax for the 4PM encounter. Priyanka Chopra acted well. So did Naseeruddin, his son Vivaan, Annu Kapoor, Usha Uthup and people like Joh Abraham, Irrfan Khan and Neil Nitin Mukesh were just livestock in the screenplay. The one who disappointed was Vishal Bhardwaj. Not only was the direction sloppy, the music too was unbearable. I liked the movie Kites. Found this one more boring. The stories were at best half baked. Priyanka remarries half a dozen times. When one's marriage culminates in a sad ending, one gets weary of venturing into something again. Not jump in half a dozen times. There should be more compelling reasons to do so. Unfortunately for the viewers, Vishalji did not show us any. No one murders in such cold blood as Priyanka did. There was an ocean of insensitivity about her character which the director attempted to mask as a soft corner in the woman's heart. Bad move. She appeared more a psychopath rather than a person wronged. From someone who had kept the viewers at the edges of their seats in epics like Omkara and Kaminey which really had much less meat in the storyline, it was extremely disappointing. I loved the last line. I too felt quite alienated while watching the movie because despite being a Literature student, the emotions couldn't "connect" with me. The music was a terrible letdown except for Darrling and Bekaraan. I hope Vishal Bharadwaj rediscovers himself soon and comes back to the style of filmmaking he's most comfortable with. Hahaha...the last line was Fantabulous Doc, the highest quality of Sarcasm!